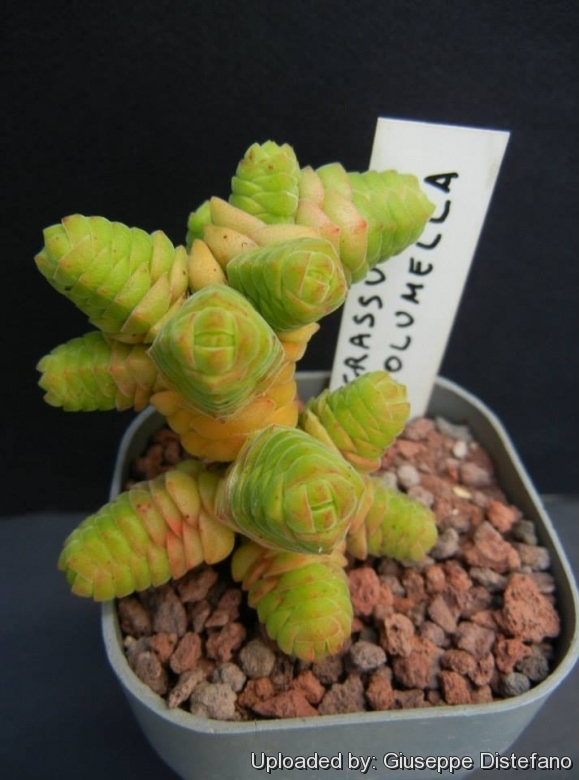 Origin and Habitat: Crassula columella are from the Winter rainfall area on the West Coast of of the Richtersveld, Northern cape of South Africa (Grootmis and Lekkersing - Namaqualand), up to Namibia. Habitat and ecology: Crassula columella grows in crevices in quartzite outcrops in dry cliffs and upper slopes on the south-western aspect of low hills. 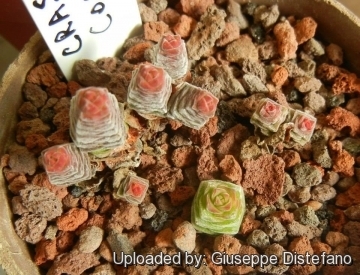 Description: Crassula columella is is a fascinating succulent plant that grows very slowly and compact (The Latin name means “pillar” or "little column" and no doubt is rightly given). It makes lovely shaped pagoda-like columns that feel velvety soft. Actually the columns are very densely packed leaves. Habit: Perennials with short upright stems that grows in tight clumps with a few branches from base or at top. The stems are completely coated by the close-pressed leaves that form a 4-angled fat, compact, velvety column 7-20 mm in diameter and up to 80(-150) mm in height (usually only twice as wide). On this way the plant has less leaf surface and therefore less evaporation. Its habit is similar to that of Crassula plegmatoides, but the latter has coarsely papillate leaves. Leaves: Broadly ovate, overlapping, , with obtuse often mucronate tips, boat-shaped, convex below, 5-8 long, 6-10 mm wide, pale yellowish green to olive-green covered with minute soft hairs and velvety to the touch. The sun can cause a pinks, purplish-red or red-brown glow towards leaf-tips and on the margins, specially in time of drought and during the resting phase. Inflorescence: The flower head is a loose globular thyrse with a hairy peduncle (15-)20-50(-60) mm long. Flower: Calyx lobes triangular, fleshy, green to red, 1-1,5 mm long, bluntly acute or obtuse hairy with marginal cilia. Corolla tubular, cream to pale yellow, fading brown with oblong-elliptic lobes 2-2,5 mm long,spreading to recurved. Stamens with brown anthers. Blooming season: Autumn (In habitat February to April). Cultivation and Propagation: Crassula columella are quite smart for the extremely dry circumstances where these plants grow. But not so difficult to grow if you remember not to over-water in the Summer when they're taking their rest. They can grow easily on window sills, verandas and in miniature succulent gardens where they are happy to share their habitat with other smaller succulent plants, or in outdoor rockeries. They are spring and autumn grower (summer dormant). Soil: They are tolerant of a wide range of soils and habitats, but prefer a very porous potting mix to increase drainage. A non-acid soil is ideal. You can grow a plant in a 6-10 cm pot for years and have perfectly happy plants. For best results, use a shallow pot. Watering: Winter grower, provide some water all year around, in the wild most of the growth occurs during spring and autumn- recommend water less in summer. During the winter months, water only when the soil becomes completely dry. Wet soil quickly causes root and stem rot, especially during chilly winter months, but can re-root if taken care of. No water should ever be allowed to stand around the roots. Low ambient humidity is always needed. Roots will rot in ever damp soil. Sun Exposure: They need full sun or bright, filtered light with ample airflow to stay compact, generally needs full sun part of the day to bloom, but avoid direct blasting sun in mid summer (with sun exposure the leaf develops a nice reddish tint), they do not do well in full shade as they tend to etiolate, fall over and rot easily. Pest & diseases: Crassulas are sensitive to mealybugs. Rot: Rot is only a minor problem with Crassula if the plants are watered and “aired” correctly. If they are not, fungicides won't help all that much. Care must be given in watering, keeping them warm and wet while growing, and cooler and dry when dormant. Use: It is an excellent potted plant great for windowsill culture as well as in rock gardens. Indoors only in brightest position. Pruning: Remove old leaves from plant base and dead flower spikes only. Propagation: They are easily propagated by the removal of off shoots, remove a lateral shoot and insert the basal part buried in the soil. This shoot should root within a month, and small offshoots will form at the base. They can also be grown from seed.